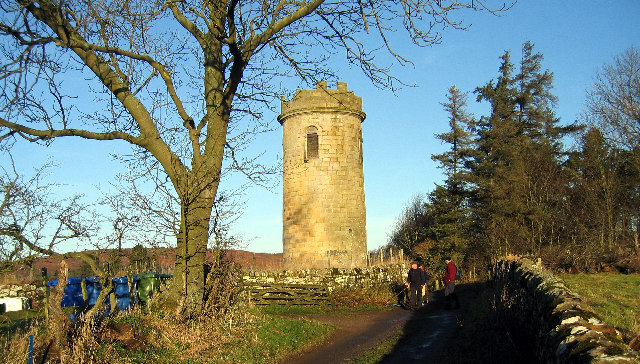 Sharp’s Folly, or Tower, is reckoned to be the oldest folly in Northumberland. It is situated near Whitton, a little to the south of Rothbury, and was built in the 1720s by Rev Dr Thomas Sharp, Rector of Rothbury during 1720-58. The tower is privately owned so the visitor cannot climb its internal cantilevered stone staircase. However, as you can see from the picture, passing hikers can get close enough for a good gawp. Just occasionally, an individual who takes the time and trouble to record the life, times and history of their own little patch manages to attain a sort of historical standing of their own. Put simply, they become famous for being historians. In the countryside around Whittingham and Rothbury, one such character is the distinctively named David Dippie Dixon. Dixon was born in Whittingham in 1842 and died in Rothbury in 1929. Though he was never what you might call a professional historian, he will forever be remembered for his two seminal works on the history of his homeland, namely, Whittingham Vale, Northumberland: its History, Traditions, and Folk-Lore (1895) and Upper Coquetdale, Northumberland: its History, Traditions, Folk-Lore and Scenery (1903). His unusual middle name was actually his paternal grandmother’s maiden name, and he was born, brought up and schooled in Whittingham, a few miles north of Rothbury. From the age of 13 he worked in his father’s drapery and grocery shop in the village, then, in 1862, he entered into formal partnership with his dad when a second shop was opened in Rothbury. In 1869 he married Mary Hindhaugh and they lived above the Rothbury shop. Always interested in local history, over the years he investigated various aspects of the landscape around and about his native land. Folklore, traditions, songs, archaeology, wildlife, culture – all of these, and more, took the interest of the young man as he threw himself into recording the past by joining a multitude of societies and organisations. Naturally, he edited the local parish magazine, and even found time to act as a guide for visitors to the area. The couple’s only child was born in 1870, after which Dixon went into business with his brother. His many, many years of historical investigations eventually bore fruit in the publication of his two classic books either side of the turn of the century. His brother, John, illustrated the works. Though original (and expensive) first editions can still occasionally be found, Whittingham Vale and Upper Coquetdale have since been reprinted several times and are still considered standard texts for those interested in the history of the area. As is so often the case, the original author never profited greatly from his efforts. In fact, his business hit the rails in 1911 and he was forced into retirement. Fortunately, though, he was offered a role as live-in librarian at the nearby Cragside estate, where he and his wife saw out their days. The couple were buried in Rothbury. In 2014, a 17-metre long Archimedes Screw was installed which generates around 10% of the property’s power. And, best of all, it is open to the public! Of the stories concerning the many ‘lost villages’ that lie scattered across the North-East the saddest of them all is surely that of the cursed township of Wreighill in the parish of Rothbury, Coquetdale. Today only a farm bearing the ancient name clings to the lofty prominence to the north-west of Hepple; the sole reminder of the tragic little village whose name was once synonymous with death and destruction. Its roots lie deep in the mists of antiquity. Lying yards to the east of the Roman road which links the Devil’s Causeway to Dere Street, 5½ miles west of Rothbury, many ancient bones have been discovered high on its hill. The Romans – invariably occupiers of settlements previously conquered – have left their own faint remains of a camp, too, in the area. For a millennium after the Romans departed its progress remains a mystery, indeed its very existence throughout the Dark and Middle Ages remains in doubt. Suffice to say that by the late fifteenth century it was known as Wreigh- or Wreck-Hill – for reasons I will now attempt to explain. Being situated on the western-most extremity of the Coquet valley, the few dozen inhabitants were frequent victims of the infamous Border reivers. 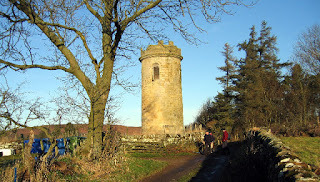 On countless occasions Scottish raiders descended the Cheviot foothills around the turn of the fifteenth century only to find the poor village in their way. It became a way of life for the villagers, but they simply refused to be beaten, regularly standing up stoically to their foe. The Scottish freebooters, though, vowed to some day make them pay for their determined resistance. Undaunted, the villagers defiantly stood their ground as best they could over the months and years, but pay they finally would on the fateful night of 25th May 1412. On that terrible Wednesday evening a mighty Scottish band appeared on the horizon and the troubled locals braced themselves again, fearing the worst. A fierce encounter ensued but, overpowered by numbers and might of arms, the village was overrun. Its inhabitants were slaughtered, many being pursued long into the night until not a soul remained, the village itself being burnt and laid waste. Until the early years of the twentieth century the phrase “the Woeful Wednesday of the Wreck-Hill” was an oft used metaphor in those parts to all that pertained to cruel, total and mindless slaughter. Thus, on account of its fateful existence, the village came to be known as Wreck-Hill. “Wreigh” was a convenient enough derivative, and the reasoning for the development of the present-day place-name held good for a long while. But this story is not the source from which the village’s name is drawn, and the truth, though quite different, remains equally as morbid. “Wreigh” is, in fact, derived from the Old English wearg, meaning a felon or wrong-doer; and Wreigh-Hill, or Felon’s Hill, was where such offenders were put to death – not by hanging but by strangulation! It is likely that nearby Wreigh Burn was simply named after the village, but not impossible that its meaning is identical to that of Throckley’s Wreigh Burn, i.e. the burn where undesirables were summarily drowned. By and by, as the violent age of the Border reivers and the moss troopers passed into history, so the village recovered. In 1665, however, came a second great calamity, as the isolated settlement was tragically and almost entirely wiped out by the Plague. The story goes that a small parcel was opened by a Miss Handyside which had been sent to her by a young gentleman in London – where, of course, the terrible disease was then raging – whereupon the deadly pestilence sprung out and spread over the whole village, poor Miss Handyside being its first victim. By all accounts almost everyone suffered, with only a few hardy folk surviving, who themselves interred their dead where neither plough nor spade would ever turn them up. A century later, though, when the potato arrived in the area, the steep slopes under which the dead lay were put to use and countless brittle bones were unearthed. Thankfully, however, little Wreighill is most recently remembered as being the birthplace of the once nationally famous mathematical genius, young George Coughran. Born in 1752, the son of a Wreighill farmer, Coughran showed signs of his extraordinary talent in his infancy. Thrust uncompromisingly into the fields of his father’s business as a child (where he also excelled), he continued his studies part-time at every opportunity. He began to correspond with the Newcastle Courant, anonymously, arousing great public interest and admiration. His identity revealed, he became the subject of great local and national acclaim, securing many awards. He eventually became Calculator to the Astronomer Royal (a sort of human computer), rising to the height of his fame as the country’s outstanding genius of his time, before being tragically struck down at the age of 21 by smallpox in Newcastle in 1774. He was buried in the town’s St. Andrew’s churchyard. After the turn of the nineteenth century Wreighill’s population never topped 30. As the Industrial Revolution gathered pace and the masses flocked to Newcastle for work, Wreighill, and villages like it, emptied. Only the old stayed, and when they died so the villages died – and this is the real reason behind the deaths of so many hamlets and villages across the country. Thus Wreighill went under for the third and final time, contracting to a small farm by 1900, which it remains to this day.